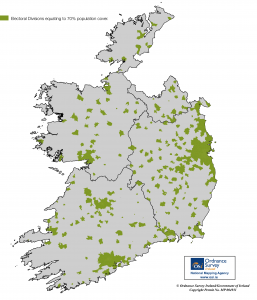 Thousands of rural dwellers may lose coverage in the next licensing round from Comreg. Comreg propose that only 70% of the population of the country needs to be covered,this is approximately 10% of the landmass, which equates to mostly the east coast and a few hot spots around major cities/towns. Inevitably this will lead to a decline in current coverage levels as telecommunications providers struggle with the recession and the inevitable rolling back of their networks as there is no longer a regulatory necessity to invest or maintain the networks in more rural areas. This is a decision driven by a flawed ideology that competition will drive up coverage in areas not to be served. We’ve seen to date this ideology in action where vast swathes of the country currently do not have any broadband access. The bottom line is why invest in “uneconomic” areas if there is no need to make that investment, only regulatory obligations will drive investment.